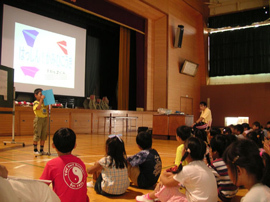 An elementary schooler reports on his summer break during a gym assembly. Photo from Kagata Elementary School. For elementary, junior high and high school students, summer vacation lasts, on average, from July 20 through August 31. There are regional differences with this schedule, however. Because summer vacation does not mark the separation between academic years, students will often have homework to do and will even continue to come to school to take part in their club activities. For some schools, students will have to come to school on several occasions for school functions, such as assemblies held in the morning during the summer vacation. For junior high and high school students, summer vacation does not mean a vacation from studying. Indeed, for those who are preparing to take entrance exams to high school or college later that year, the summer vacation may be a time of even more intense studying for them.